Located in Tulette, in the heart of the Drôme Provençale, the 3-star campsite Les Rives de l'Aygues enjoys an ideal location to discover some of the wonders of the South of France. Villages of charm, curiosities of nature, oenological heritage, emblematic cities ... the ideas of outings are not lacking. Avignon, Orange, Vaison-la-Romaine are just a few kilometers from your charming campsite. The Ardèche is only an hour away, as is the famous Mont Ventoux, paradise for cyclists. Surrounded by the vineyards of Côtes du Rhône, you will not fail to indulge in wine tourism. 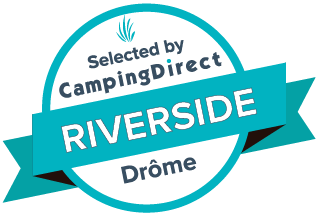 You will notice it when you arrive at the Rives de l'Aygues, charming campsite in Drôme Provençale, the vineyards occupy a special place. You are at the heart of the Côtes du Rhône appellation, your stay in Tulette is a golden opportunity to enjoy it. Go meet local producers, more or less known, stroll along the paths bordering the wineries. Your campsite is only twenty minutes drive from Vacqueyras and Gigondas ... a half hour from Beaumes-de-Venise. Less known, Sainte-Cécile-les-Vignes is less than 10 minutes. Heritage and history lovers, do not miss to visit these four emblematic cities of the South of France that are Vaison-la-Romaine, just 20 minutes drive, Orange, less than 30 minutes, or Avignon, in less than an hour. Discover also Nyons, about twenty minutes only. Enjoy your stay at the Rives de l'Aygues to discover the villages of Provence. Naturally, we think of the famous Saint-Rémy-de-Provence and L'Isle-sur-la-Sorgue, located about an hour away from your 3-star campsite in Drôme Provençale. The trip is worth the trip! At the edge of the Aygues, you will meet very few fishermen. And for good reason, connoisseurs meet at Lake Bel-Air located about 500 meters from your family campsite in Drôme Provençale. The owners of the campsite will be happy to give you directions.